During certain times of the year you will find Dr. Kristy Duran in the midst of Chompe (local Spanish term) bushes, picking the little red berries. Though small in size this berry has many uses. It is traditionally used for both food and medicine. It is there bathed in the orange and red light of the Rocky Mountain sunsets that she connects her culture to her work. 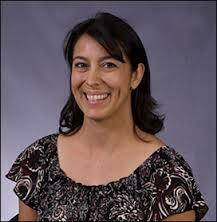 Dr. Duran is a biologist and associate professor at Adams State University (ASU). In this small rural university in southern Colorado place-based research is a staple for many professors. The San Luis Valley, where ASU is located, is a vast treasure trove of opportunities for research in all the sciences. Dr. Duran comes from a very small town that boasts only 740 residents. The town is also home to doctors, educators, activists, environmentalists, and others invested in making their little part of the world a better place. As a professor in a rural area Dr. Duran finds that the small class sizes make it easier to connect with her students and help them find connections to this place she calls home. For example Dr. Duran has been teaching at ASU for the past seven years. She said it has been a dream to be able to return the Valley and teach. In 2013 Dr. Duran founded the SACNAS club for ASU students. In 2015 the club was officially recognized as a new student chapter of the SACNAS organization. The national organization was established to increase diversity in STEM fields and stands for the Society for the Advancement of Chicanos and Native Americans in STEM. On the ASU campus students have come to know the SACNAS club through their participation in fairs, homecoming activities, STEM Saturdays, and student orientation. Dr. Duran has provided the SACNAS club members with the opportunity to participate in community work through the Bureau of Land Management programs in the San Luis Valley. Dr. Duran also takes her SACNAS students to the annual conference. This year students were exposed to different fields in STEM and learned about several career paths for PhD’s. Dr. Duran said that because of that experience many of her SACNAS students are now considering graduate school. Among her many accomplishments, earlier this year Dr. Duran was honored for her community work and inducted as an SLV Corn Mother along with six other Valley women. Dr. Duran teaches Gen Bio, introduction to biology, environmental science, plant ecology, plant physiology, plant systematics, vegetation and habitats, and bio geology. To learn about Dr. Duran click on the highlighted links in this article to see videos and related websites.